No first-year coach in Washington’s men’s hoops history has pulled off a quicker turnaround than Mike Hopkins, who almost can’t believe it himself. 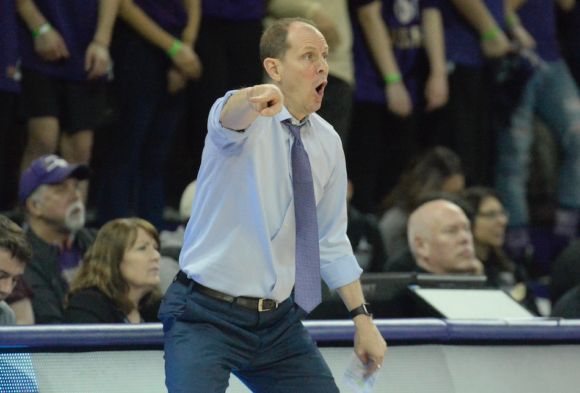 Despite a fade in the final six weeks, the Washington men’s hoops turnaround under first-year head coach Mike Hopkins was a revelation. He took holdovers from the collapsed regime of Lorenzo Romar, added a local recruit he convinced to stay, Jaylen Nowell, instilled organization and inspiration, and went from nine wins to 21. Atop the slag heap of a men’s basketball season in the Pac-12 Conference, the Huskies were the rose. To the list of exactly everyone in the college hoops world who didn’t see this coming, add one — Hopkins. By one measurement, UW hoops hasn’t been stretched like this in its history. The season ended Monday at 21-13 after an 85-81 road loss in the second round of the National Invitation tournament to St. Mary’s, at 30-5 perhaps the best team not asked to the NCAA tourney dance. The 12-win improvement year-over-year exceeded by one the previous mark for first-year coaches set by none other than Clarence S. “Hec” Edmundson, for whom the hoops house was named (yes, kidlets, there was a time when high-achieving people were more honored than corporations). Colleague Steve Rudman compiled a chart that shows in 1920-21, the Huskies were 18-4 in Edmundson’s first season after Stub Allison went 7-8. The 11-game pivot stood for nearly a century until Hopkins, an accomplished but unsatisfied assistant for 22 years under Syracuse legend Jim Boeheim, came west. Once Hopkins realized that Boeheim at 73 was just getting going after 42 years, the notion of the promised succession to head coach at his alma mater seemed a little silly. It’s hard to know whether Hopkins’ decision to abandon the royal line of succession at a fabled program was more surprising than the success he had in his first season at Montlake. But it matters not because the deed was done well. What seemed a reach by athletics director Jen Cohen turned out to be a firm grasp of the circumstances and the need. The season peaked Feb. 3 with the upset of eventual conference champion Arizona on a buzzer-beater by Dominic Green for a 78-75 triumph. Thereafter the Huskies lost seven of their final 11 to fall out of the unanticipated conversation about making the NCAA tourney field after a six-year absence. The win over the Wildcats revealed a weakness that helped thwart the tourney bid: An over-reliance on freshman Nowell. The game-winning shot developed out of a bad play call and execution: A clear-out so Nowell could work from the top of the key one-on-one. Hopkins had gone to the play several times earlier in the season, with success. But defenses became hip, sliding over a second player to help to frustrate Nowell, who led the team in turnovers (83) as well as scoring (16.5 ppg on 45 percent shooting). This time, UA’s seven-foot center, Deandre Ayton, was waiting and swatted the shot nearly into the University Village parking lot. Green intercepted the sizzler and converted it into one of the most memorable moments in UW hoops history. Lucky bounce? Sure. Every team gets a few, and UW was in position to exploit it by being tied with the then-14th ranked team in the country. Bad sign? No. Hopkins may have over-played to a star talent, but he won’t be the last coach so inclined. The key for the future is a of talent balance so a defense can’t cheat. The problem seems to have had a partial solution this week. Word came this week that the Huskies received a verbal commitment from seven-foot center Bryan Penn-Johnson from Wasatch Academy in Pleasant, UT. For whatever these things mean, ESPN ranked Penn-Johnson 85th in its recruiting list for next season, and ninth among centers. Video shows him to be a mobile big guy capable of way more scoring inside than noble but over-matched Sam Timmins, the 6-11 redshirt freshman starter this season. Whether Nowell thinks he’s NBA-ready isn’t yet known — he isn’t, as anyone including even the late Dr. James Naismith can tell — but Johnson’s arrival with three others who formally committed in the early signing period, suggests that word has traveled fast about Hopkins. It probably helps that Washington’s name hasn’t surfaced yet in the FBI investigation of big-time college hoops. Since the industry at the top is mostly corrupt, it would be wise to to assume nothing either way. But if there is no implication, Hopkins is well-positioned to exploit the pending chaos. Gonzaga coach Mark Few has become semi-famous for his post-game, locker-room handstands to celebrate big wins. Hopkins has mastered the instant turn-around. At some point, Huskies’ fans may want to consider planning for a group cartwheel after a win over the Bulldogs. Jen gets an A+ for this hire. Are there two finer people in college sports than Hopkins and Petersen? The Huskies hit the jackpot with these two. Will be interesting to see. Hopkins is a west coast kid with aging parents…and the UW will have enough money if so inclined. Ultimately, it will come down to whether Hopkins desires to build a program of his own or attempt to continue the success of a legend. If it were me, the former would be more appealing. Who could’ve ever hoped the program would have a one year turnaround like this ? I loved coach Romar , but his guard heavy recruiting without the requisite power forward or true center ( there were rare exceptions ) always hurt the team . And I hate to say it , but he was a better recruiter than he was a coach .. Enter Hopkins . The 2-3 he installed worked wonders and got them 20+ wins , but again in games this year you could see the effect lack of size had on inside scoring and rebounds . Noah was your only true presence in the paint offensively or defensively this season ; Timmons had zero effect offensively and was good for a couple of blocks/rebounds a game . Adding Penn-Johnson to this roster should have an immediate impact . And I’m loving the fact coach Hopkins can recruit back east for us and still land the local stars who always dreamed of being a Dawg . .. I seem to recall , didn’t Cohen hire him like 2 days after firing Romar ? It sure seemed like a pre-arranged thing to me considering how fast it occurred . Probably knew he was hot property and may have had other suiters . Have to agree with Husky73 , hiring Cohen looks like a home run alright ! For those who missed the St. Mary’s game – they fought back valiantly from down 14 to get within 3 , lost by 4 . St. Mary’s has a fantastic point guard ; the passing to the low post ( almost always a bounce pass , which frustrated me Dawgs didn’t pick up on that ) for them was terrific and they shot lights out from 3 . Heartbreaking to watch this incredible season come to an end , but some terrific news already with the new pups coming in , can’t wait till next year when we go DANCING !! .. watching Penn-Johnson vids on YouTube ; the kid’s a shot blocking machine , and he can dunk which of course most big guys can . But he also has a sweet little turnaround jumper , and he can hit free throws ! Somebody call Jabar this summer and teach him the baby hook and the kid will be unstoppable .